Saul 'Canelo' Alvarez knocked out Britain's Amir Khan in the sixth round in Las Vegas to retain his WBC middleweight title. Until the brutal ending, Khan had used his superior speed and movement to frustrate the champion and appeared to be well ahead on points. However, when Khan lost concentration for a split second the champion knocked him cold with a huge right hand. Afterwards, Alvarez said he wanted a unification bout with Gennady Golovkin. Khan, 29, jumped two weight divisions to challenge Alvarez and was attempting to become only the third former light-welterweight world champion to win a middleweight world title. The match was made at a catchweight of 155lb, five pounds under the normal middleweight limit. However, Alvarez came into the ring at approximately 175lb and was noticeably bigger than his opponent. The fight was the first at the 20,000-capacity T-Mobile Arena, which was vociferously pro-Alvarez on the Mexican festival of Cinco de Mayo. But the booing and jeering that rained down upon Khan did nothing to cloud his focus. Khan probably edged a cagey first round courtesy of a couple of flurries and one well-aimed right cross, although Alvarez did land with a flashing left hook. Khan repeatedly made the champion look clumsy in round two, landing with rapier-like combinations before darting out of range. And when Alvarez landed with a juddering left hook, Khan stood up to it and returned fire. 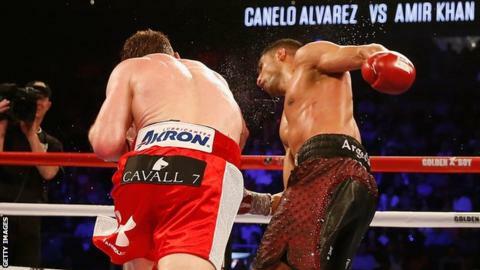 It was more of the same in the third, with Alvarez, 25, stalking his prey and finding himself confounded by Khan's blinding hand-speed and volume of punches. At this stage Khan's prediction that speed and movement would trump power looked like it might come true, while he was certainly confounding those critics who said a year of inactivity would blunt his edge. Khan unleashed more flashy combinations in the fourth and while none of his punches appeared to be hurting Alvarez, the Englishman appeared to be well ahead on points a third of the way through the contest. There were signs in the fifth Alvarez was beginning to find his range and at the start of the sixth he connected with a hurtful left-right combination. And when Khan left his left hand dangling soon after, Alvarez exploded an overhand right on his chin, rendering him unconscious before he hit the canvas. Khan was counted out with 23 seconds remaining in the round. Khan took a while to come round but finally clambered to his feet minutes later. "I wanted to go out there as a champion, but unfortunately I didn't make it to the end," he said. "This challenge came and it was hard to turn down." Alvarez improved to 47 wins (33 knockouts), one draw and a sole defeat - by the great American Floyd Mayweather in 2013. Khan now has four defeats from 35 fights, including three by way of knockout. Boxing has been searching for new superstars since last year's much-hyped but ultimately disappointing clash between Floyd Mayweather and Manny Pacquiao, since when both men have announced their retirements. And Alvarez-Khan was widely viewed as an opportunity for one or both of them to become the new face of the sport. Alvarez having prevailed, there will be a huge clamour for him to fight WBA and IBF title-holder Golovkin, who was invited into the ring after Saturday's fight. The unbeaten Golovkin, 34, has 32 knockouts from 35 fights but would most likely have to come down in weight to make a fight against Alvarez happen. Whether that fight can be made this year or not, Alvarez has already proved himself a worthy successor to Mexican greats such as Julio Cesar Chavez, Ruben Olivares, Salvador Sanchez and Marco Antonio Barrera. As for Khan, he should be applauded for his willingness to take a risk and still has options, the most obvious being a fight against fellow Briton Kell Brook. The cross-Pennine rivals have been circling each other for years, with Khan always claiming Brook does not belong in his company, despite being the IBF welterweight champion. But given the devastating nature of his latest defeat, that is probably not a claim he can continue to make with any credibility. "Amir was boxing beautiful; it was a very cerebral fight from him. "Canelo knew he was getting scored on and it was a beautiful performance up until that point. It was a shame that punch came. "It was one of the knockouts of the year. A sensational one-punch knockout. "You almost feel bad for Amir though as he was making you wonder how Canelo was going to break him down."